Can you tell us a bit about your condition and how you came to be diagnosed? Generally speaking, fibular hemimelia is a disorder that occurs at the point of limb budding when you’re an embryo in the womb, and for some reason one or two of your limbs don’t bud off properly, and you are left with usually one or two legs where the tibia is misshapen and the fibulas are missing, floating or are misshapen and shortened. You very often get a club foot, and the issues predominantly are orthopaedic – so musculoskeletal. I was born with one leg shorter than the other, and I had a club foot with only four toes. But I wasn’t diagnosed, and I didn’t get my diagnosis until I was 49 and a half – so back in June 2015. As with most rare diseases, you are just treated symptomatically, and so people just dealt with the offending issue. For me, it was that my right leg was shorter by one and a half inches, but they predicted that by the time I hit puberty it would be four inches shorter. They suggested limb-lengthening to lengthen my tibia and fibula, and at a later stage to correct my club foot by trying to straighten it and fuse some of the bones. That’s how it started, and I needed to see a surgeon at St Margaret’s hospital in Epping a minimum of every six months. From the age of seven I had surgery after surgery after surgery. I was seen by an eminent, well-established orthopaedic surgeon, but he didn’t like talking to patients and the parents weren’t allowed to be at the bedside when he did his ward rounds. I couldn’t say I liked him, but I was very familiar – he enabled me to walk and saved my leg. But at the same time, it was completely normal and accepted that he was fairly monstrous. He was the expert; he said he was the only person in the country doing this, so there was absolutely no question of challenging him in any way. How did that doctor/patient distance affect your experience of the diagnostic process? 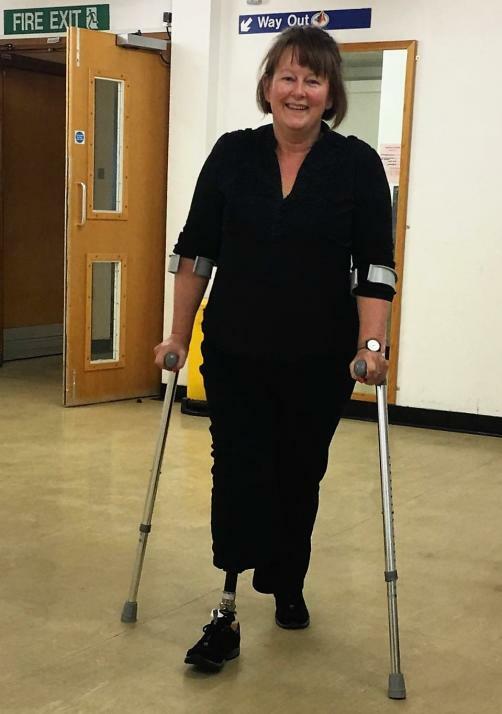 Fibular hemimelia is on the border between rare and ultra-rare as a condition – think it happens to about one in 50,000 people – so very few people come across it. It’s only the orthopaedic surgeons at super-specialist centres that know what it is. It’s the same syndrome that Oscar Pistorius and Aimee Mullins have. Usually, they just amputate your leg or legs at birth, but because I had a relatively mild form, the surgeon did wonders with lengthening my right leg. I went through years and years or horrible hideous surgery, but he lengthened my leg and I managed to keep it through hell and high water until I was 50. Two years ago I had to have it amputated in the end because I was just in so much pain; ultimately he enabled me to maintain a reasonable quality of life. Has your own experience driven you to try and help others in similar situations? At 18, I was in the wilderness because nobody takes ownership of you. Once you come out of paediatrics, you are farmed out to the relative specialities and abandoned, and that’s something that I am desperate to do something about, to the point that I’m a trustee on a new charity. Rare Disease Nurse Network (RDNN) is an offshoot of the Cambridge Rare Disease Network, and its aim is to provide specialist nurse case management and care coordination to patients and families to help them navigate through this minefield of multiple specialists dealing with you. Like all patients with rare disease, it’s not usually restricted to that particular disease. I’ve got fibular hemimelia but I also have collagen deficiency and because of because of I have degeneration in my shoulder; I also had infertility; I’ve got carpal tunnel syndrome, and arthritis in my left knee because I’m having to put so much weight on it. So I’ve got a shoulder consultant, a knee consultant, a leg consultant, a rehabilitation consultant, a prosthetics team, and a pain management team – multiple specialities. As a patient, you’re starting your history from scratch with different specialists again and again and again, and that gets very wearing. I know the system, but people who maybe have less familiarity and opportunity with the system can get lost, so that’s why we’re setting up RDNN. Can you tell me about some of RDNN’s work? We’re still in baby steps at the moment and we haven’t secured our charity status yet, but our vision is to provide signposting and navigation for patients and their families through the system. Like I said, I’ve got six different specialists looking after me, and because in the NHS you can never see two people on the same day, it means that I’m in a hospital or clinic once a week every week. I have on average five appointment a month and it would be an awful lot easier if I could just say ‘I don’t work Mondays, so I’m going to do all of my appointments then’. But it doesn’t work like that. So you’re really looking for reform in the way that patients with this condition are treated while they are receiving care? That’s really difficult to do, but what you can do is have people who help the patients navigate that, who can liaise with the outpatients and liaise with the different systems and services. You have access to the outpatients’ booking systems and medical record systems; you can take some of that burden from the patient. What do you think people should really know about fibular hemimelia? It has lots and lots of different bits that, when all pulled together, suddenly become a syndrome. I’ve got two missing cruciate ligaments, which are the two fundamental ligaments in your knee that cross over each other and essentially hold the top of your leg onto the bottom of your leg, and that is a classic symptom of fibular hemimelia; it wasn’t picked up for me because people weren’t looking for a syndrome, and because it’s so rare, people weren’t aware of it. I’ve had a lifetime of knee surgery and there is a tremendous temptation of surgeons to go in and operate, such that children and adults with the condition, because they have no stability of their knee, actually develop what’s known as ‘augmented stability’, even though they haven’t got those ligaments. So a lot of patients don’t need cruciate ligament replacement, but of course they didn’t realise that with me, and thought they must replace mine, and that has given me ongoing issues because of repeated surgeries. It’s quite often valuable to just say ‘let’s hold off and see how I get on’, and not being too gung-ho. The other thing is to push to get yourself referred to someone who can help. In the UK we’re not very good at that, particularly with austerity and the ever-increasing reduction in funding in the NHS – we’re being curtailed and it’s getting harder and harder to get referred to specialist units. If you can get into the system, the care available is superb, but it’s getting into the system and seeing people who know what they’re doing. There is a wealth of knowledge out there, but it’s how you access it that’s really difficult, and my advice to anybody with a rare disease is: don’t take no for an answer – keep pushing.